Do you like sweet potato? Black beans? If you answered ‘yes’ to both questions, then here is a simple yet satisfying plant-based recipe for you! It uses less than ten ingredients and is a delicious combination of sweet with savory from the mix of sweet potato with caramelized onions and black beans. Pair this vegan, egg-free, dairy-free, gluten-free and nut-free dish with cooked couscous, quinoa, farro, rice, pasta, barley, or your favorite gluten-free starch alternative. It can also be savored on top of warm slices of wholegrain toast, especially if the toast is first smeared with a thin layer of a nut or seed butter. If you prefer an oil-free version, just sauté the diced onion in a some vegetable broth that has been heated in the skillet. This is a quick filling meal that can be easily cooked up for you or your family at any time of the day! A quick to prepare vegan, egg-free, dairy-free, nut-free and gluten-free delicious main course meal to be paired with your favorite grain or gluten-free alternative. Cook the sweet potato using the microwave (poke a few holes into the potato using a fork or knife, sprinkle some water on top of the sweet potato and then heat in a covered microwave-safe dish for 2 minutes at a time until it is cooked through. Test this by inserting a fork or knife into the sweet potato. It should be cooked through if the knife or fork inserts easily. Be careful when removing the potato from the microwave!). Alternatively you can cook the sweet potato on the stovetop using a steamer or in boiling water. Meanwhile, drain and rinse the canned beans (if you don’t have cooked beans available) and dice the onions. Cook your preferred grain or gluten-free alternative on the stovetop. Heat up half a tablespoon of oil in a skillet on medium heat. Once the oil is hot, sauté the diced onions in the oil until soft and translucent (at least 3-5 minutes). Add in the cooked or canned black beans and the salt, pepper, garlic powder and onion powder. Mix together and let cook for another 5 minutes, stirring occasionally, until the beans are heated through. While the beans are cooking, remove the skin off the sweet potato and mash. Add the measured amount of mashed sweet potato into the skillet mixture and stir together. Taste and adjust seasonings as desired. That's it! This dish is ready to serve with your favorite cooked grain or gluten-free alternative. Top with a sprinkle of fresh chopped basil if you like. If you have time, sauté the chopped onions longer until they are caramelized to heighten the flavor of this recipe. For adults, you can use firmer cooked black beans for more texture in this dish, but parents with young children may want to use well cooked black beans instead. This recipe also works well with other cooked or canned beans such as small white navy beans or red kidney beans. You could also sprinkle some fresh chopped cilantro on top instead of chopped fresh basil leaves. If you’re not a big fan of onions, you can reduce the amount in this recipe to a ¼ cup of diced onions. 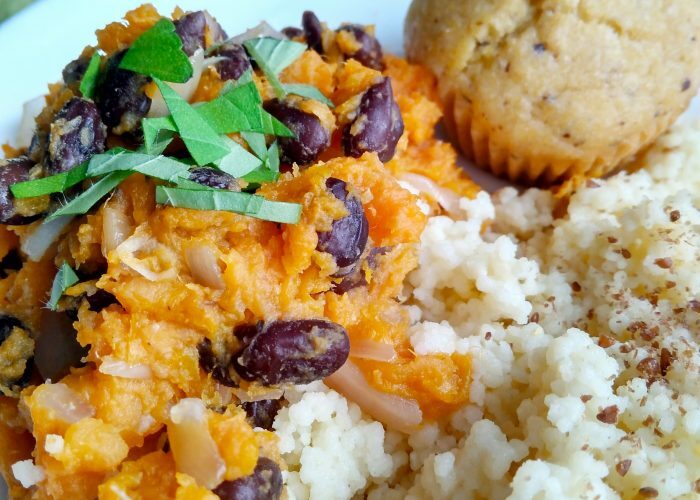 This recipe works great if you already have some leftover cooked sweet potato or extra cooked black beans sitting in the fridge. Save any leftovers for another meal the next day or take it to work or school. You can even put this filling in a tortilla wrap to make a nourishing meal as a breakfast burrito for yourself or your children the following day. I loved it even more with a sprinkle of fresh chopped basil on top but my eldest daughter preferred it without. Regardless, that first evening when I made it, she claimed it was her favorite dish of the day (alongside chocolate)!